Kathy's been up since 5:30. She now has 5 pies: cherry, chocolate, pumpkin, and 2 pecan ready for lunch. Plus 60 dinner rolls rising on the counter; plus a ham is in the oven. Last night with my help she chopped broccoli, cauliflower for a salad, made a marinated vegetable salad and a cranberry salad. Corn and cream style corn mixture and mashed potatoes remain. Coming from next door, corn casserole, green beans, turkey and dressing, strawberry cake and an icebox pie. By 3pm, the family should feel fortified. I've felt bad lately about not blogging, but seemed to have hit a writer's block that I explained away by saying I'm just too busy. Actually, maybe the real reason is that I got a new computer last spring, a Google Nexus pad. I use it quite a bit, but with no physical keyboard, it doesn't lend itself to writing. "Hi, I've been wondering whether you-all had returned from your trip. Did you see much rain while in CO? Were you at South Fork the whole two weeks? I bet the stay was fun. We'd planned to leave this morning for a couple of days in OKC, but we've been hit with a stomach virus. I was just getting over it when Kathy started having problems yesterday afternoon. We'll have to delay our trip several days. B's [my oldest brother] heart function tested nearly normal at his last doctor's appointment and he's back to walking a couple miles each day. He and P are making plans for their move to Enid and for a fall RV rally. Not bad for having back-to-back heart attacks. B still has the lymphoma cancer problem and will take some sort of chemo every couple of months. Don't know how long that will last, maybe from now on. I need to learn more about that, but I'm reluctant to press questions right now. L [our son] likes his new job. He still works for OU, but is now in a different group. This group is putting historical documents on the Internet. The first will be a large collection of Civil War soldier family letters. C's [a ten year old my sister-in-law is trying to adopt] adoption is still pending. His mother did a last minute objection despite having not seen or contacted him for the past four years. The 'best interest' hearing will be next Thursday. Hopefully, that will go in our favor and then the adoption process can be re-scheduled. We survived our Labor Weekend section party. Fed pulled pork and chicken to 50-60 relatives, friends, and neighbors. Nearly everyone brought a dish so we had plenty of food. Weather for the evening turned out nice after all. Guess we lucked out there. We had fun. Maybe we'll do it again next year although later in the fall. Next time I'll smoke the meat ahead of time so I won't have so much to do the day-of. I was dead-staggering-tired by dinner time. My oldest brother is a craftsman. He enjoys building beautiful things. He's furnished his home as well as the homes of his three boys with finely-crafted wood furniture, each home with a different furniture style. He's restored a century old house and remodeled several others. Kathy and I treasure a couple of his smaller wood creations in our house. Over the last eight or ten years, he's moved away from crafting in wood to restoring old cars, resurrecting them from literal rust heaps. He was working on a 1930 Chevrolet when we visited him and his wife last spring. 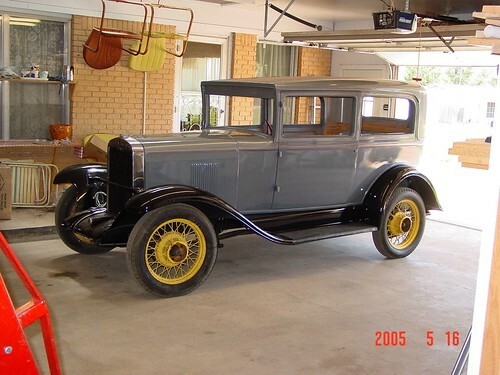 That afternoon, he took me for a ride in his first restoration, a 1929 Chevy. 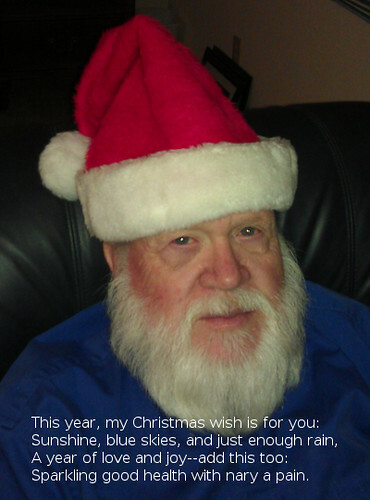 His wife gave me this picture of it for my blog. When I opened the garage door yesterday morning, I discovered that an unwelcome lady had homesteaded on and around my weedeater gasoline can. It was early, I may have caught her in the middle of breakfast or doing some tidying up, but there she was in plain view. I wanted to take some photos to document her trespass, but by the time I'd returned with my digital camera, she had retreated to her lair. Rudely, I kicked the gas can to compel her into view so I could photograph her sparkling beauty. Ruder still, I removed the gas can from the garage and sprayed it with Ortho Home Defense bug killer. As a final act of cruelty, I confess to stepping on her when in her weakness she fell from the can. I rarely see Black Widow spiders, but I know they are around. I see their webs, unkept, straglely messes than one might carelessly assume are abandoned. Wikipedia describes it this way: ". . . the widow spiders construct a web of irregular, tangled, sticky silken fibers. 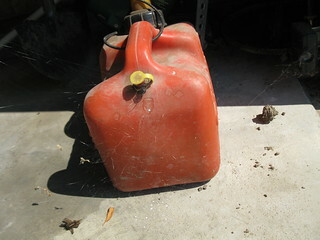 . ."
If you look closely or click on the first photo to enlarge it, you can vaguely see the web around the bottom of the gas can. The Black Widows have poor eyesight, are timid, are less-than-deadly poisonous, bit mostly defensively, and tend to live in shadows, often spending daytime in their lair and only tending web at night. Maybe I should do more research before I plant. For example, we have a nice Weeping Willow which I recently learned has an extremely invasive root system. I'll have to monitor it to keep our septic system clear of roots and safe. The tree is beautiful, over thirty feet tall, bug and disease free, an asset to our yard. I don't want to destroy it. Several years ago I rescued three Trumpet Creeper Vines from the county road grader. The vines have dark green leaves and large red-orange trumpet-shaped flowers that are a favorite refueling station for hummingbirds. The vines grow in abundance around here filling the county road bar ditches with color. Like sunflowers, they seem to enjoy dry, hot summers. 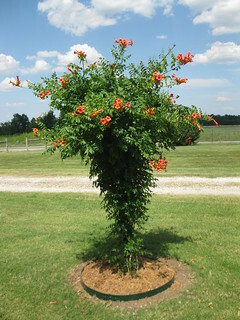 Given a post to climb, the Trumpet Creeper Vine assumes a tree shape. For years, while visiting relatives, we have admired one of these vine-trees in a Woodward, OK neighborhood. I decided we should have one for our front yard. Today, I looked up the vine on the Internet and find that an alternate name is ". . . 'cow's itch', which it earned from its origins in the nightshade family, and the itchy rash its blossoms can sometimes cause in bovines and humans who come in contact with a toxic residue produced by Trumpet Vine leaves. . ."
***BTW: If you ever come for a visit, please stay away from the pretty vine-tree in the front yard. Or where I begin my yearly tussle with my aging lawn mower on the grassy part of the yard. My mower was new in 1999. "There's a full moon over Tulsa and I hope it's shining on you." Moon rising in the southeast tonight, big, brilliant, and beautiful. And low in the west-northwest Venice sparkles. I first heard that drinking song at an impromptu party in Antarctica. It was sung by a trio of New Zealanders. But it's not true, is it? You do have to mind the weather. The terrible tornado that struck Moore, Oklahoma last Monday reminded us of that simple fact. You have to mind the weather, especially severe weather. Blizzards, tsunamis, floods, hurricanes, and tornadoes. Actually, I think you will find that Oklahoma folk do mind the weather and are very good at it. A death toll of 24 ain't bad for a devastating storm such as the massive one that ripped through the middle of Moore. The toll would have been smaller except for the bit of bad luck at the school where seven kids drowned. Schools have snow days where they cancel classes because of the danger. Perhaps they should consider canceling classes on days where there is a high risk of dangerous storms. At the present time, it's a dilemma of whether to shelter children at a school or try to get them and their parents, if you can locate the parents, safe at home when you have only minutes of warning. It's more than just the danger of wind damage, nationaly storms kill more people with road flooding and lightning. We had plenty of warning that the bad storms would happen, at least a week. The weather forecasters told us what to expect. We were waiting for it. And watching. In Oklahoma, storm watching is an armchair spectator sport. All the tv stations have the latest radar and other gadgets that they are anxious to demonstrate and to talk about. They have their storm chasers deployed all around with video cameras ready to catch every nuance of the cloud formations. The news helicopters hover in the air ready to zoom to the latest sighting. Oklahoma tornadoes are tracked with radar, video, and 3-d analytics from before they start to after they finish. So we knew the bad was coming, we just didn't know where or when or how bad. This time there were three days of storms, with tornadoes the first two. A glancing blow hit Shawnee the first day and then the middle of Moore was scraped, scoured, and destroyed the next day. I don't have the total tally of tornadoes across the state. The same day as the Moore big one, there were a dozen garden-variety ones in northeastern Oklahoma where I live. Moore is two hours distant and, except for the tv reports, I'm detached from the drama. I went to school with one of the ladies who died, but hadn't seen her for over fifty years. One memory still reverberates in my mind; that of teen anguish. A young mother we know received final goodby texts from her teens as they crouched in a darkened school hallway convinced that their end was imminent. They all survived. So did their house. July 1970. I'd just wrecked my 1967 Corvette by driving too fast while too drunk. I was in the Canadian Province of Quebec operating a crew of twenty doing seismic mapping along the south side of St Lawrence Seaway. I was working long hours and partying hard in my spare time. We were staying across the river in Trois-Rivières. The town had a delghtful beer garden with a great band, and the French-speaking ladies were good dancers. A good friend, an old boss, had recently died of emphysema complications, and I was smoking over two cigarette packs each day. The company I worked for wanted me to spend the next winter above the Circle on Banks Island. The money was good, but I ended by saying no thanks, I think I'll just quit and go back home to Oklahoma. And I did, giving them a month's notice. On the trip home,I quit smoking and mostly quit drinking. That's probably why I'm still alive.